Even though we’re talking serious Thanksgiving fare this week, neither of these has ever made an appearance on a Thanksgiving spread of my childhood. Back home, Thanksgiving has always been a big to-do, but a slightly non-traditional one — a typical table with my mother presiding is laden edge-to-edge with dishes like roasted duck, shining from a savory soy sauce glaze and stuffed with sticky rice, lap cheong and Chinese wood ears; spicy slow-braised lamb shanks with the meat so tender it’s falling off the bones, swimming in buttery-soft radishes and wide glass noodles; my mother’s special mapo tofu simmered with the salty broth left over from sauteed whole shrimp; garlicky green beans flash-fried with onions and savory pork. My job growing up — outside of some clumsy chopping and the dreaded dishwashing — was to contribute the one or two “American” sides that my brother and I clamored for (I know, we were such grateful consumers of my mom’s phenomenal cooking.) Usually that just meant pouring hot water over Kraft Stove Top stuffing or rehydrating dried mashed potatoes — because I was stellar in the kitchen in high school (not). Ever since then, I’ve had a fascination with the truly homemade, from scratch versions of those just-add-water dishes I used to “make.” I took a run at mashed potatoes last winter, but stuffing and sweet potato casserole have lingered on my to-do list until now. 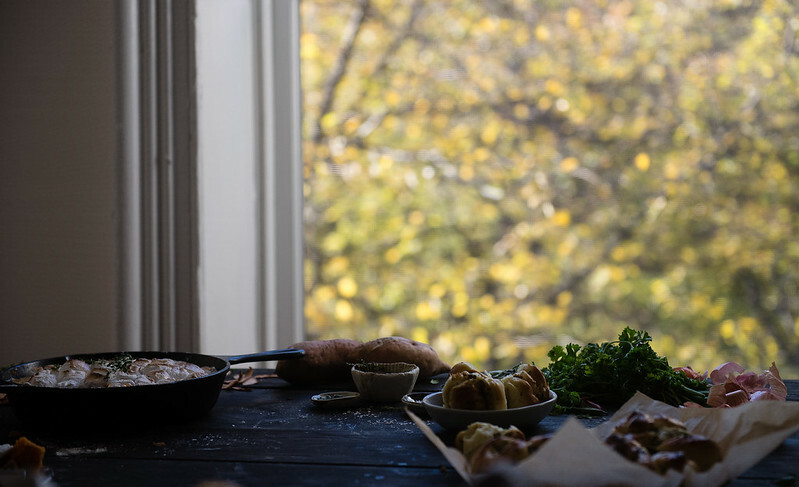 I went into this fall with the full intention of making traditional cornbread stuffing all on its own — until I came across these stuffing-flavored pull-apart knots a few weeks ago and all bets were off. Guys. Thanksgiving stuffing dinner rolls. J. Kenji López-Alt is a mad genius with a fantastic name. These rolls are my chicken-based, Stove Top-y twist on his sausage and sage rolls (because I’ll always have a shameless love for Stove Top stuffing, no matter what happens) but they’re every bit as insanely delicious as Kenji promises. I based the dough yet again on my favorite dreamy-soft Hokkaido milk bread, only I swapped out the cream for 1/4 cup of savory chicken glace, reduced from a cup of chicken and vegetable stock, and knotted the dough up around an intense filling made from all the fantastic stuffing flavors of my dreams — shallots and celery sautéed in plenty of butter, with sage, parsley, and a bouillon cube for extra oomph. Fresh out of the oven, the rolls are a umami wonderland. 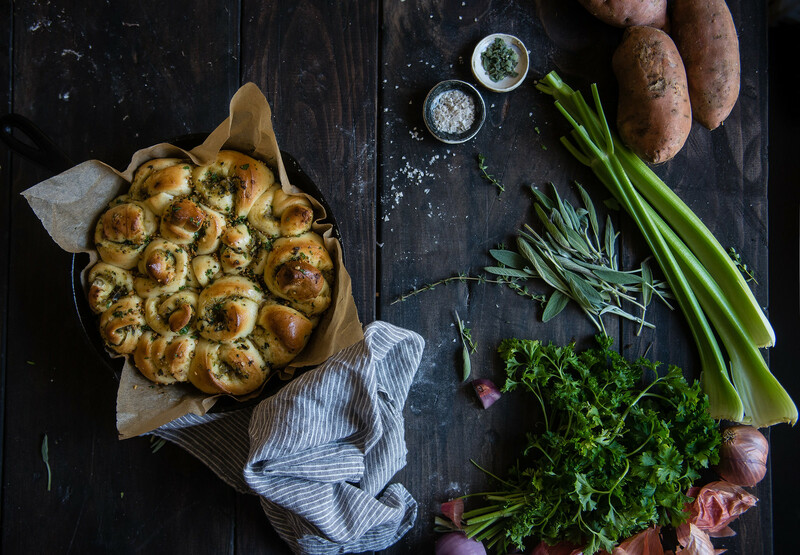 They taste just like a stuffing reincarnated in buttery-soft, fresh-baked rolls, and they’re a treasure to pull apart and eat piece by piece. 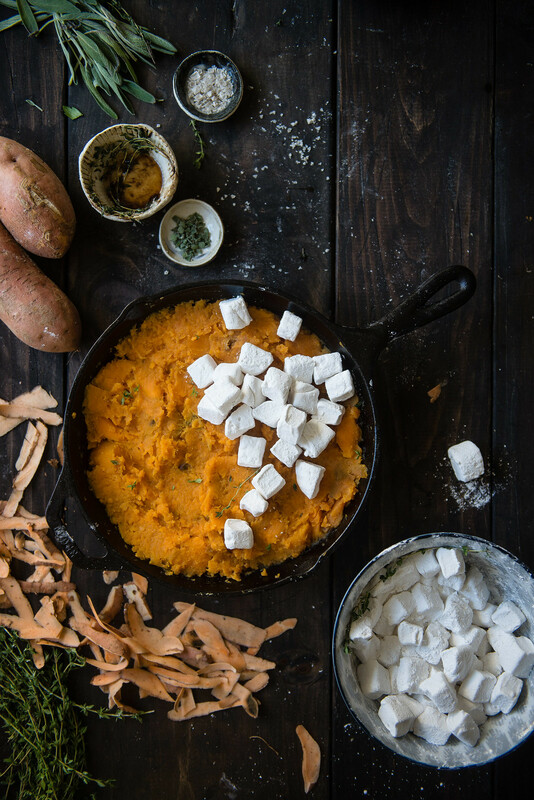 As for the sweet potato casserole, I’ve had herb-y marshmallows on my mind for some time, but the sweet potatoes underneath got their treatment from another Serious Eats gem by BraveTart. Like the best things in life, they’re beautifully simple, but with a result that’s surprisingly complex. Just a sprinkle of thyme, a few tablespoons of nutty brown butter, and a drizzle of pure maple syrup, plus a thick, toasty blanket of thyme marshmallows on top, and the result is sticky, caramelized, gooey, syrupy sweet but faintly savory decadence. Every bit as delicious of a side-disguised-as-dessert that I imagined it would be. All told, these two are vying for my favorite things I’ve made in recent memory. I stuffed my face ’til I couldn’t move even though my wedding dress fitting is in less than a month (!) and I wandered around the kitchen for days after it was all gone in the vague hope there was still some left. All things buttery, carb-y, rich, and flavorful. So good. I’ve still got grand plans to tackle my mother’s legendary dishes to share with you … but first I have to stop dreaming about these. Hope you’re all staying warm and traveling safe if you’re heading homeward for the main event next week! And P.S. 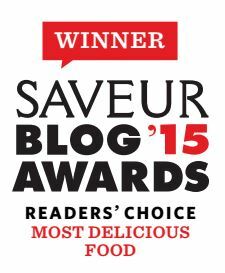 Don’t forget to enter this Vermont Creamery giveaway if you haven’t already! It ends this Friday at midnight! 1. Combine water and thyme in a small saucepan and bring to a simmer. Let simmer for 1-2 minutes, then remove from heat and place in the refrigerator, covered, to chill until cold. 2. Grease the bottom and sides of a 9×13 baking dish or pan and dust generously with confectioners’ sugar, or a mixture of half confectioners’ sugar and half cornstarch. In addition, grease a rubber heat-proof spatula (these ones by GIR are my favorite) and set it aside within easy reach, for later. 4. When the syrup reaches the right temperature, remove pan immediately from heat. Start an electric mixer (or a stand mixer, if you have one) on low in the gelatin mixture and pour sugar mixture slowly into the gelatin. When all the syrup is added, beat the mixture on high speed until the mixture is white, thick, and almost tripled in volume, about 6-8 minutes. It will take longer with a hand-held electric mixer (up to 10 minutes or more, depending) and shorter with a stand mixer. 5. Using the greased spatula, pour the mixture into your dusted baking pan and smooth it out as best you can. Sift confectioners’ sugar generously over the top. Once it’s well-powdered, you can use your fingers to press the mixture into the pan if you need to. Let marshmallow set until fully cool, at least an hour and up to a day in advance. 6. When you’re ready, run a knife around the edges of the baking pan and invert the marshmallow onto a large cutting board. You may need to help loosen it in certain spots. 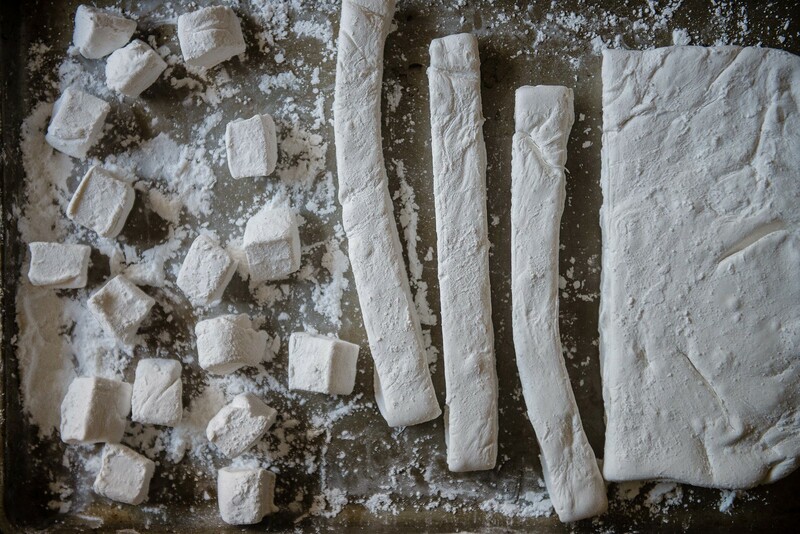 With a well-oiled knife or pizza cutter, cut marshmallow into cubes the size of your choice. I cut mine into 1/2-inch cubes, because why go big when you can go mini? 🙂 When they’re cut, dust generously with more confectioners’ sugar (or roll the marshmallows through confectioners’ sugar in the empty baking pan) to make sure all cut sides are coated, then set aside. Notes: For fluffier marshmallows, you can whip two egg whites to firm peaks and fold them into the marshmallow mixture after Step 4. Also, I thought the thyme marshmallows here came out with a nice, subtle floral flavor, but if you want to up the thyme-iness of the mallows, you can take a teaspoon or two of fresh thyme, patted dry, and blend them into the sugar with a food processor (or chop them very finely) for a stronger flavor. 2. Meanwhile, melt the butter with the thyme in a small saucepan over medium heat until butter crackles, turns a rich brown, and smells nutty. Turn off the heat, remove the thyme, and whisk in the maple syrup. 4. When you’re ready to serve, turn the oven to broil. Optionally, sprinkle a few more thyme leaves across the potatoes. Add the marshmallows in an even layer over the top, and slide it under the broiler. Broil until the marshmallows toast to a golden brown, with some darker edges (or a bit burnt, if you prefer!) I was scared to broil at first, but it’s simple! If using a gas oven, you can just leave the drawer open to keep a close eye on the marshmallows, and to rotate the pan as needed. It should only take a few minutes, so just don’t leave them unattended. When they’re nicely toasted, remove and serve! Yields about 16 medium rolls, or enough to fill an 8×8 baking dish. Inspired by J. Kenji López-Alt. 1. First, make the tangzhong — a “water roux,” or flour paste that helps keep the bread fluffy and extra-soft. In a small saucepan, whisk together 6 tbsp chicken stock and 2 tbsp bread flour until no lumps remain. Heat the mixture over medium-low heat, whisking constantly. The mixture should thicken quickly to a gel-like consistency in no more than 1-2 minutes. As soon as lines appear in the mixture when stirred, remove from heat and transfer to a small, clean bowl. Cover and set aside. 2. In a heavy-bottomed saucepan, heat the cup of chicken stock over medium heat. Let simmer for about 20-30 minutes, until reduced to about 1/4 cup glace. Let cool. 3. In a medium bowl or Pyrex measuring cup, warm the milk briefly to just above room temperature, about 110 degrees or lukewarm to the touch. I do this simply by microwaving it for 10-15 seconds. Sprinkle the yeast over the milk and set aside for 5-10 minutes for the yeast to activate. For my yeast, I prefer Fleischmann’s — yeast can be a tricky, mysterious thing, but I’ve found their yeast to be consistently reliable and the flavor to be more fragrant. My experiences with other brands have sometimes involved dead yeast or over-proofing, and that’s never happened with them. Either way, the best trick for knowing whether your yeast is active is to wait for your milk to foam — if it does, you know you won’t be wasting your time and your flour. 4. While the yeast activates, taste your stock to decide how much salt to add to your flour mixture — if it’s storebought or particularly salty, decrease the salt to 1/4 tsp or omit it altogether. Sift together bread flour, sugar, and the amount of salt you decide on. 5. When the yeast mixture is ready, add 1/4 cup of your chicken glace, tangzhong, and egg to the mixture and whisk to combine. If there’s a little less than 1/4 cup of the glace, just dilute with a little more chicken stock or water til you have 1/4 cup. Make a well in the flour mixture and pour in the wet ingredients. Stir with a wooden spoon until the mixture forms a loose, shaggy dough, then switch to using your hands. Knead for 4-5 minutes, or until the dough forms a semi-smooth ball. The dough should be tacky and sticky but not gloppy or wet. If the dough becomes unwieldy, sprinkle flour over your hands and the dough as needed to keep kneading, but try to avoid overflouring. One tablespoon should be enough. I also find that a bench scraper helps immensely to keep the kneading process going without having to flour the surface excessively. 6. When the dough is semi-smooth, add the butter to the dough, one tablespoon at a time, and knead vigorously to incorporate. Add the second tablespoon of butter only after the first has been fully incorporated into the dough. The kneading will be slippery and messy at this point, and it might seem like you’ve just greased your dough into mess of layers. 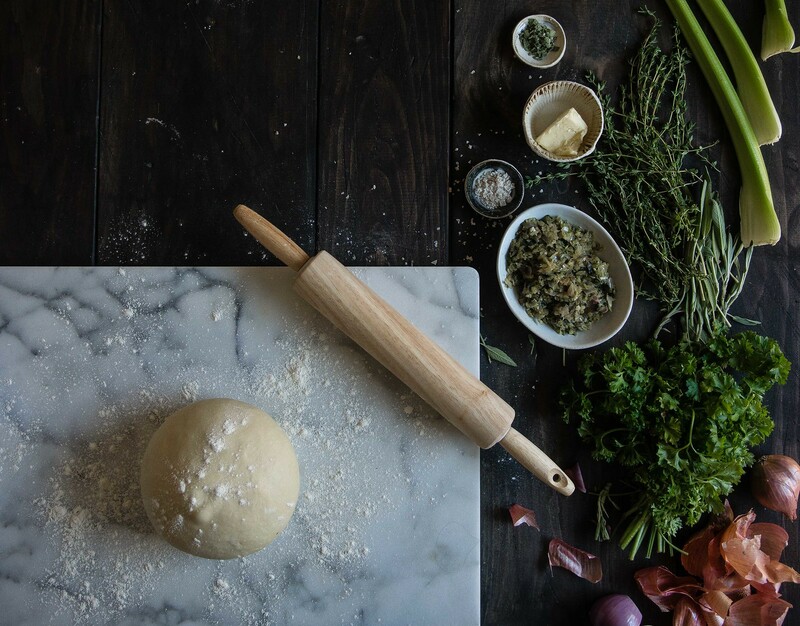 Don’t worry — just keep kneading, and it should eventually form a soft and pliable dough that’s easy to work with. (I actually find it oddly satisfying.) Knead for an additional 4-5 minutes after the butter has been incorporated, or until dough becomes pillowy, smooth and elastic. 7. Place the dough in a large bowl with plenty of room and cover with plastic wrap or a damp towel. Let proof for 1-2 hours, or until well-doubled. Alternatively, let the dough proof overnight in the refrigerator. I prefer the latter — it gives extra time for the gluten to develop, and yields a better flavor, in my opinion. Plus, dividing the labor over two days makes the process much more manageable. The dough should be fine for up to 24 hours. 8. 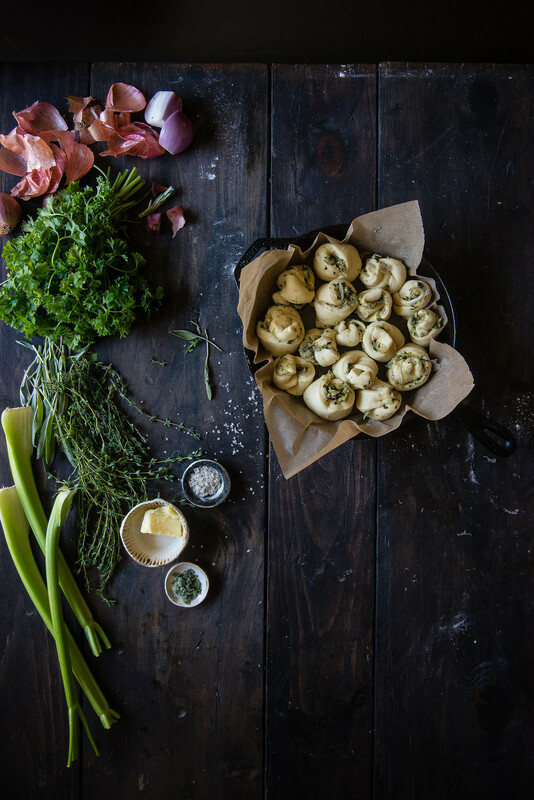 While the dough is rising, or just before you’re ready to bake the rolls, make your filling. Melt 2 tbsp butter in a saucepan. Add the shallots, celery, garlic, and sage, and cook over medium heat for 2-3 minutes, or until vegetables have softened. Add the fresh parsley and stir to incorporate. Finally, add the bouillon and stir until dissolved. Season with salt and pepper to your liking, then set aside. 9. Line a 10-inch cast-iron skillet or 8×8 baking dish with parchment paper. Turn out the dough and roll it out into a large rectangle, about 11×15 inches. Spread the vegetable filling in an even layer across the rectangle. 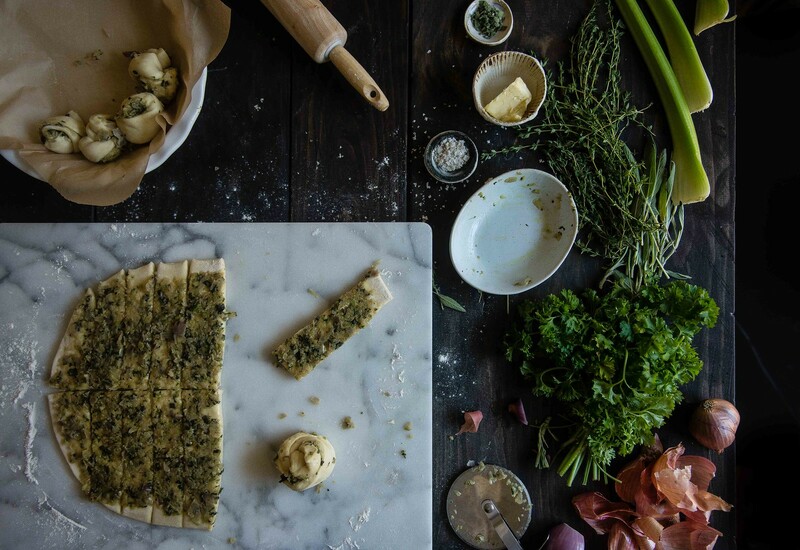 Cut the dough in half lengthwise and about eight times widthwise, to form sixteen short strips. Loosely tie the strips into knots or coil them (it doesn’t much matter how you do it) and place them, evenly spaced, into your baking dish. 10. Let proof again until nearly doubled, another hour or so. After about 40 minutes, preheat the oven to 350 degrees. Test the dough by pressing gently with one finger; when the indentation bounces back slowly but remains visible, the dough is ready to bake. Whisk an egg with a splash of milk and brush the egg wash over the dough. Bake for about 25 minutes, or until golden-brown on top. The tops of the rolls should be fairly hard when touched, but should move easily — so you know the innards are still nice and soft. 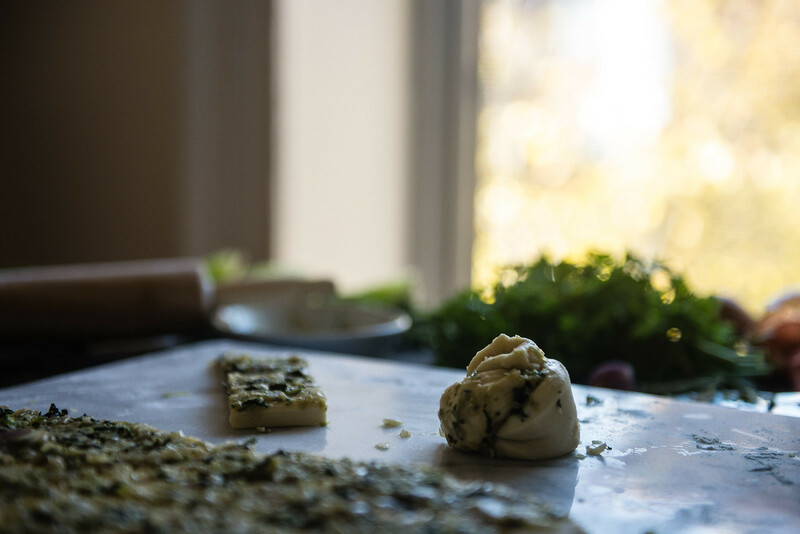 Before serving, melt more butter and mix with additional chopped parsley, then brush over the rolls while they’re still warm. The kind folks at Karo and Fleischmann generously offered to send me their products for my use in this post. Since they’ve always been the brands of my choice, I was more than happy to accept, but all opinions here are solely my own. Thank you so much to Karo and Fleischmann for facilitating my Thanksgiving celebrations! 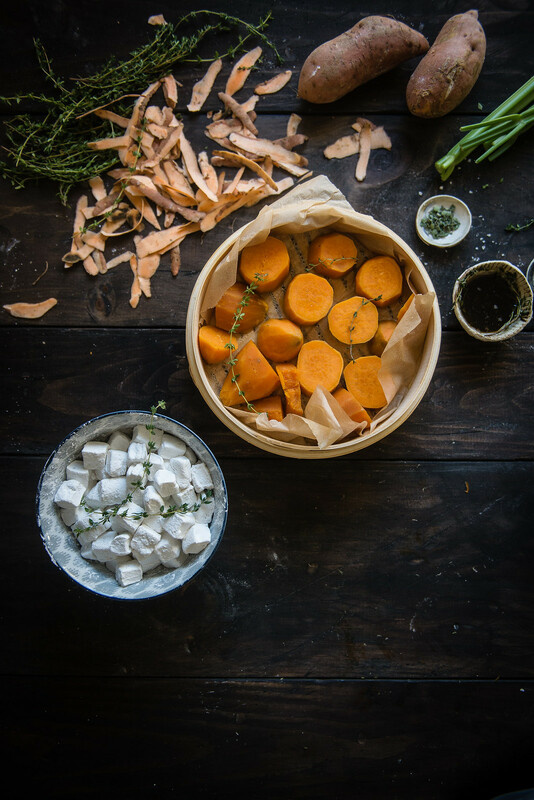 « kabocha, sage, & crème fraîche pappardelle // a vermont creamery giveaway! Oh my gosh, you’ll LOVE IT. Kenji Lopez deserves a patent for those things! Oh my gosh, these are awesome! 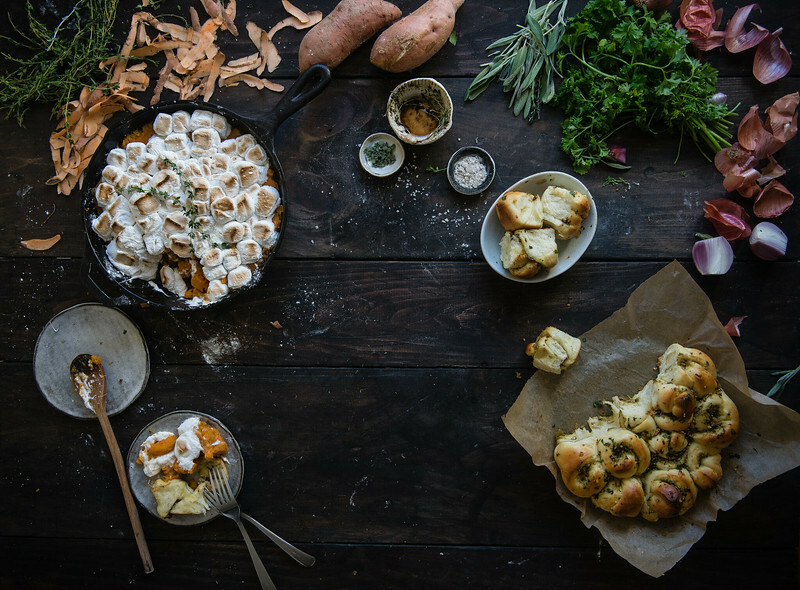 Those marshmallows are insane and the stuffing rolls just genius!! I want to be at your Thanksgiving for sure! Also, I am scared of a whole chicken…can’t imagine a turkey! I can’t decide which I like better, the casserole or the rolls. They both look incredible. Amazing post! Baha LOVE that you spotted it!! 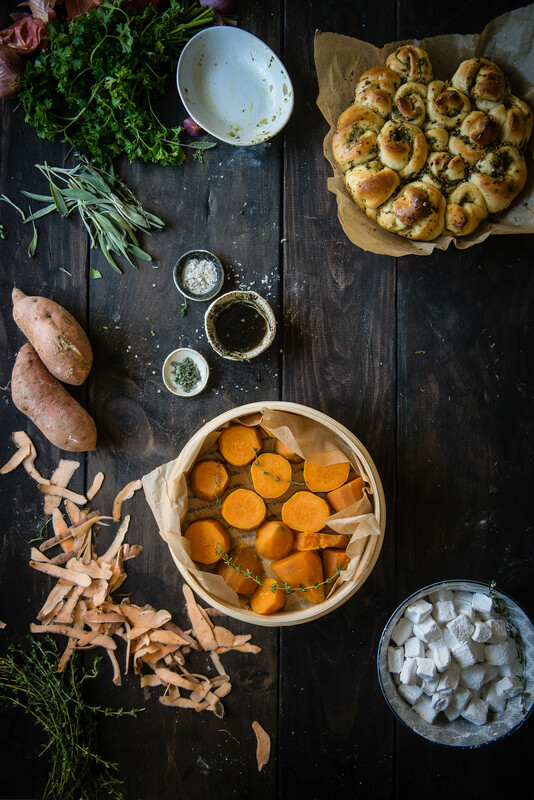 Fist bump for the bamboo steamer :):) And I am convinced that we don’t need Thanksgiving to eat Thanksgiving foods — I have a feeling I’ll be making these again in totally off-season months 😉 Thanks so much, Belinda! Oh my gosh!!!! You made your own marshmallows!! That’s so amazing. I think I have to give this a try. My husband’s family (complete with two teenage sisters) are coming over to Boston this Thanksgiving, so I’m doing a sort of Chinese/American Thanksgiving, with Chinese dishes such as sticky rice, si ji dou, and scallion pancakes, but also traditional dishes such as turkey (durr), sweet potatos, and biscuits. And now I think I’ve found what rolls I will be making. Thanks :). YUM. Your Thanksgiving sounds like ours!! Chinese-American mash-ups are the way to go :):) Hope you have a fabulous Thanksgiving, Betty! Thanks, Maryna! 🙂 I think they mix more often than it seems at first glance! For your first attempt at these dishes, I think you NAILED IN. I’m in heaven right now looking at your photographs. Gorgeous AND so delicious! Looks like you had a lovely Friendsgiving. Those rolls! I love your idea of adding chicken glaze to the dough. That’s genius! Can’t even imagine all those complex flavors. You totally passed the lets-be-proper-adults-and-host-a-thanksgiving-party test. P.S. My mouth watered reading the dishes that you were being served as a child. I truly hope you’ll post some of those recipes one day. THOSE. ROLLS. OH MY GOODNESS. Also, I love that you had roast duck for Thanksgiving as a child. We always did the combo — traditional American on one side, kalbi and kimchi on the other. Everyone wins. I could pretty much eat that sweet potato casserole and those rolls for Thanksgiving and be a happy camper. No turkey, no cranberries, just those two things. They look INSANE. woah, what a bunch of lovely flavours! love how festive and inspired this feels. Oh my gosh, I think my husband might actually die of happiness if those stuffing rolls were placed in front of him – they look so fantastically amazing! the rolls! the rolls the rolls the rolls! such an incredibly smart and beautiful thing, holy crap.those rolls are blowing my mind. i lack the words. Oh my goodness, EVERYTHING about these sides sounds and looks absolutely amazing!! Since I am a huge fan of your dreamy hokkaido bread, I have to try these rolls too. 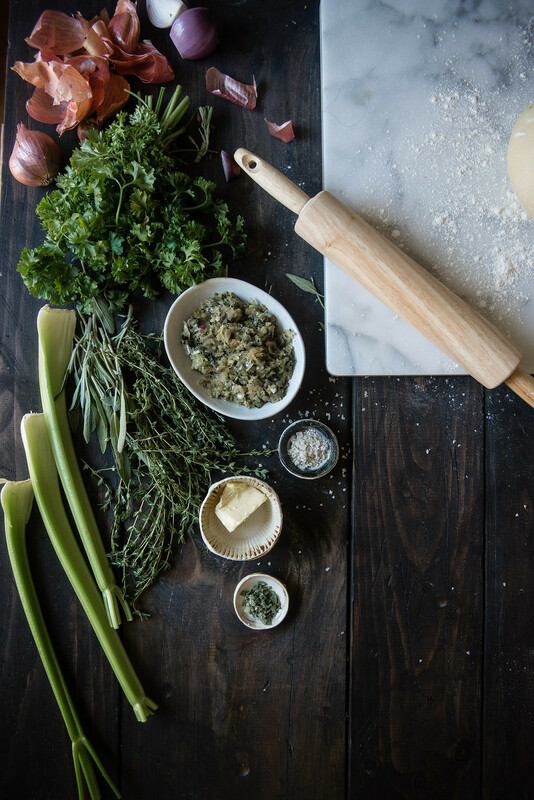 Does the celery taste good in the stuffing or is it pretty dominant? As for the rest of the stuffing herbs: Love them all! Ohmygosh, I just want to pull up a chair. I’d probably be rude and ask for thirds, though. Those rolls!!! Perfection. I cant believe I never thought of stuffing rolls. Stuffing is probably one of my favorites and combined in a roll like this YES. This is so, so, so STUNNING. 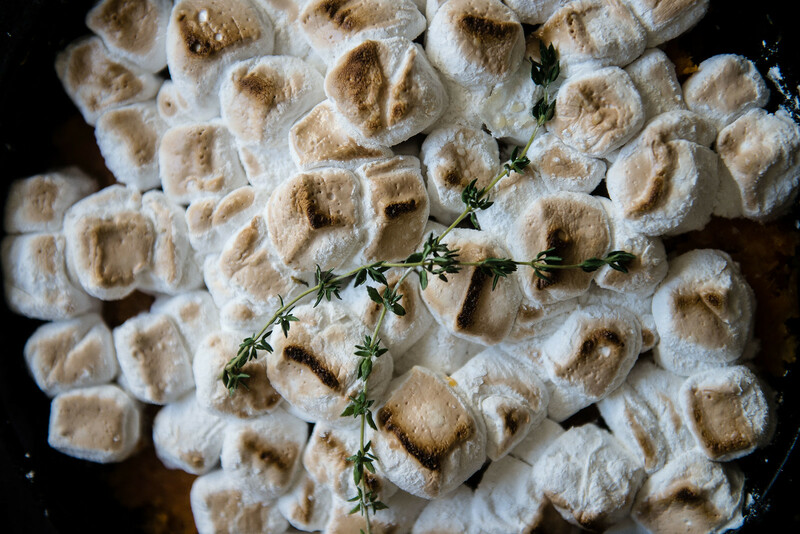 Also THYME marshmallows = MIND BLOWN. I’m dying over this deliciousness! I’ve never thought to put stuffing in a dinner roll but HELLO! Two for one up in here. In loveee with both of these! 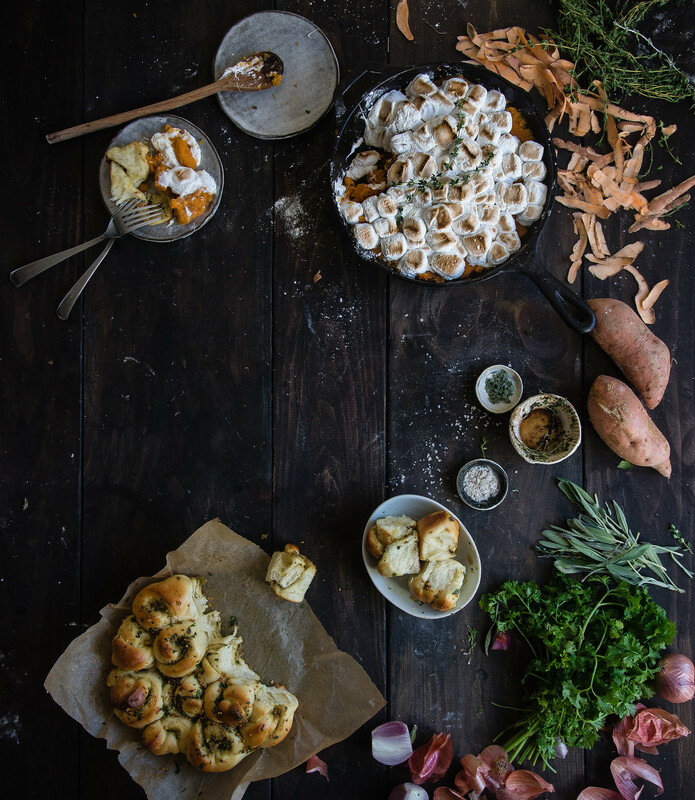 These photos are beyond beautiful, and WHOA savory marshmallows! The fact that you’ve even gone and made these just reinforces your awesome status in my book. Favorite things all rolled up in one. Hah! Happy Friendsgiving, Cynthia! If only I could celebrate it at your dinner table! Those dinner rolls! 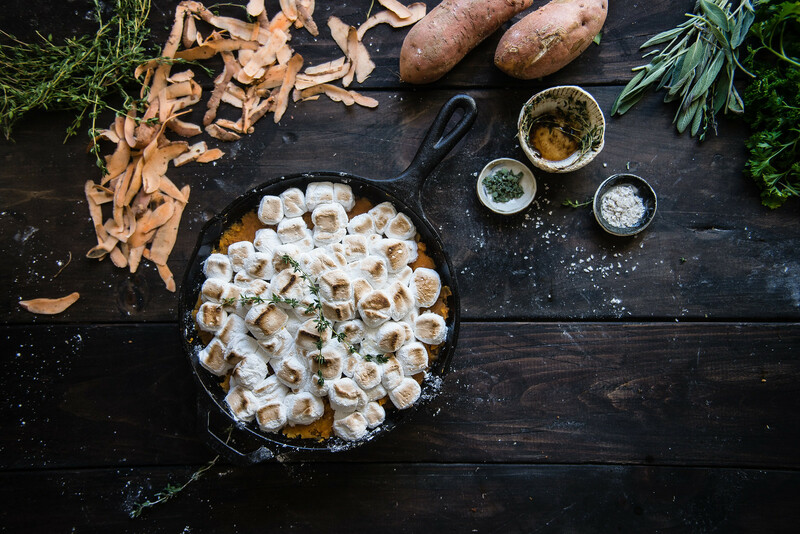 And I love your sweet potato casserole with homemade marshmallows – brilliant! 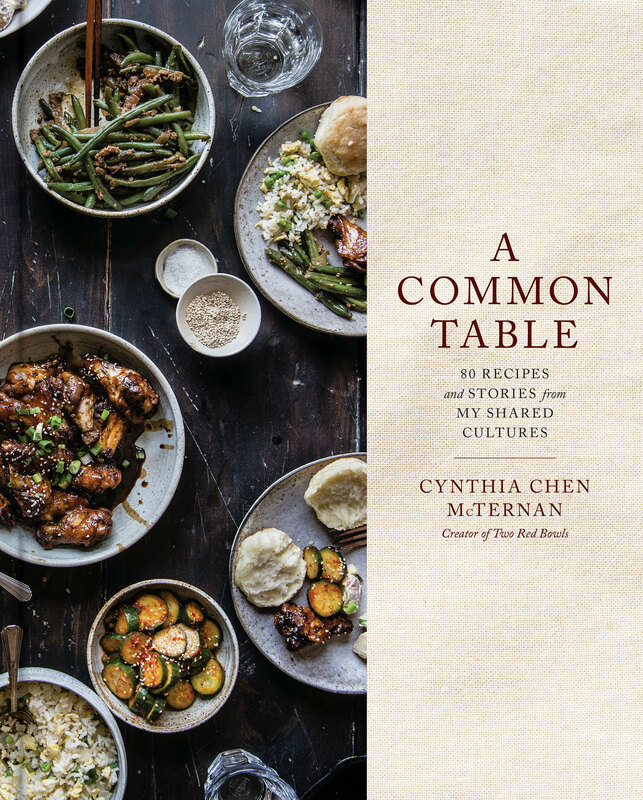 gosh, cynthia, i love your reminiscence of your thanksgiving table as a child; and i love even more that thanksgiving, and its food, are a lot more about family coming together and eating a delicious meal, rather than making what’s “supposed” to be on the table. your thyme marshmallows totally blew my mind, what a fantastic idea! and those stuffing rolls, ohmygosh! every time i scrolled over them in this post my mouth literally watered, too too good! OMG these pictures look beautiful. My favorites from your blog hands down. The recipes – wonderful. And I bet everything tasted as good as it looks. 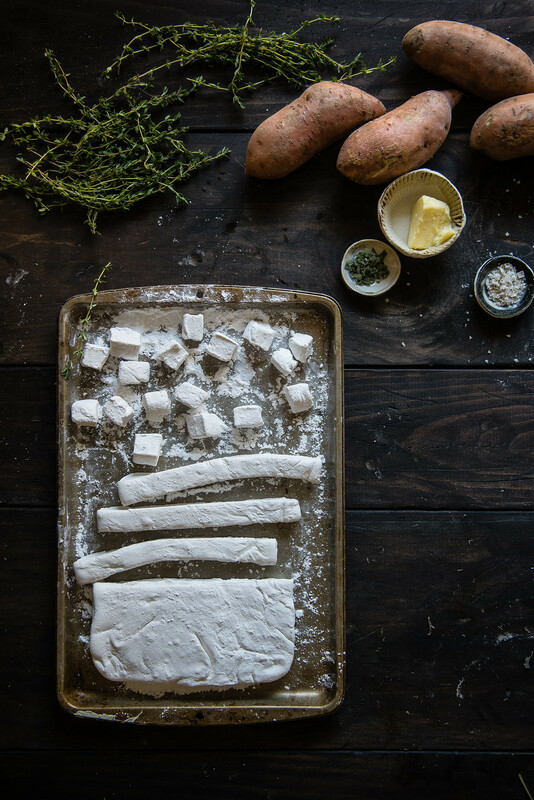 You had me at thyme marshmallows — both of these recipes look incredible!! those rolls look INCREDIBLE! love your photography! Thyme marshmallows?! Genius! Love your gorgeous photos as well. I really need to try sweet potato casserole one of these days. This looks so good! Those rolls gahhh oh my god to good! And you made your own marshmallows?!!?? !1 Girl, I need to go round asap! Marshmallows with thyme!!! and they are homemade..
Changing my menu as I type! I’m so into these rolls and casserole. I’m in need of any make-ahead tips please! Oh my goodness, yay!!!!!!!! I’m so honored! 🙂 And yes, both of these have steps that can be made-ahead! 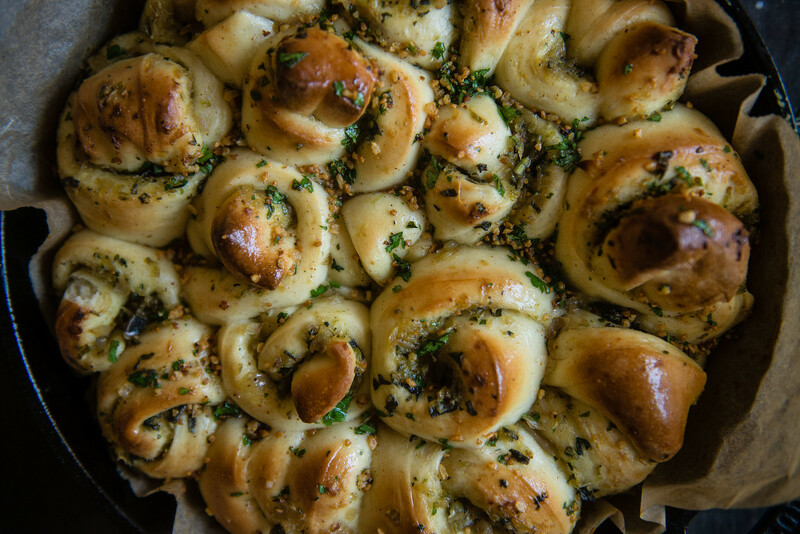 The rolls in particular have a couple things you can do for make-ahead. You can make them all the way up to Step 9, shape them into knots, then cover and freeze them before they have had a chance to rise. The night before you want to bake them, transfer them to the refrigerator and let thaw overnight. In the morning, let them come to room temperature (when they will do their second rise and proof to about 80%) and bake as normal. You can also just take them right out of the freezer the morning of and let them proof that way, but it’ll take about 3-4 hours for them to thaw then rise. Or you could actually bake them to just barely golden in places on top, about 15 minutes, and freeze that way, then thaw overnight in the refrigerator and bake right from the fridge for about 10-15 minutes at 350 degrees in the morning, until nicely golden. Finally, if you don’t want to freeze them at all, you can make these up to Step 9 the night before Thanksgiving, shape into knots, and let them rise overnight in the refrigerator, covered but not airtight (I like using Press-and-Seal). They should rise slowly overnight and be ready to bake any time on Thursday. The sweet potato casserole is a little less handy than that and will need assembling and broiling the day of, but you can definitely make the marshmallows up to a week before and store at room temperature in an airtight container, and the mash underneath can be made up to two days before and refrigerated, then simply microwaved until hot and adding it to the skillet, or adding it to the skillet cold and baking at 350 for 20-30 minutes, then adding the marshmallows and broiling. I just got so excited for Thanksgiving writing all that out!! Crossing my fingers you like the recipes if you try them!! Let me know if anything seemed unclear 🙂 Thank you so much for reading and happy Thanksgiving, Sharon! I made the Sweet Potatoes for Thanksgiving and they were a big hit. I roasted the sweet potatoes and made the brown butter a day ahead of time. I just reheated the potatoes and gave them a rough mash with the butter before serving. I was intimidated by making marshmallows at first, but it was actually pretty easy. You could probably use store bought marshmallows, if necessary. So I’m like a year late on this but OMG THESE RECIPES ARE MY EVERYTHING. And that parchment paper lining action–light bulb!!! Those rolls are soooo beautiful I can’t even handle it.